This might include: allocate environment handle, set ODBC version, allocate connection handle, connect to MySQL Server, and set optional connection attributes. This might include: allocate statement handle and set optional statement attributes. 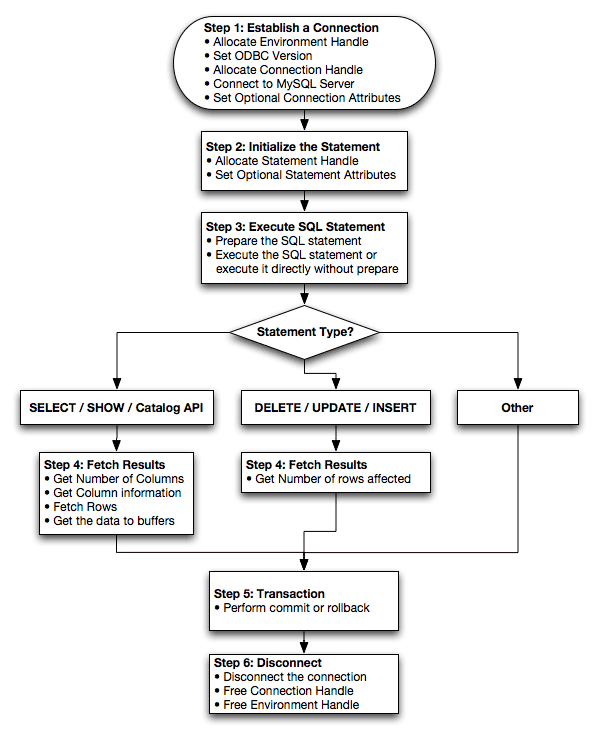 This might include: prepare the SQL statement and execute the SQL statement, or execute it directly without prepare. Retrieve results, depending on the statement type. For SELECT / SHOW / Catalog API the results might include: get number of columns, get column information, fetch rows, and get the data to buffers. For Delete / Update / Insert the results might include the number of rows affected. Perform transactions; perform commit or rollback. This might include: disconnect the connection and free the connection and environment handles.